MUMBAI: The Reserve Bank of India may face legal challenges to its rule on the age limit for bank CEOs, unless it is changed. The RBI caps the age limit for banks at 70. But under the Companies Act, banks that are also registered companies can have chief executives who are over 70 years of age by passing a special resolution. 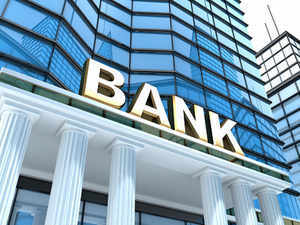 IndusInd BankNSE 1.83 % and HDFC BankNSE 0.95 % have their current chiefs reaching the RBI age cap over the next year and half, said analysts. “We believe that an extension in age limit, if it happens, will only plug the regulatory gap between the corporate sector and banks,” said Motilal Oswal analyst Nitin Agarwal. “Recent management changes in Yes Bank, ICICI Bank and Axis BankNSE 0.01 % show that the RBI exercises stricter vigilance on banks as compared to the corporate sector (regulator),” Agarwal said. The central bank will continue to retain its control over bank managements irrespective of its decision on the age limit, he added. In 2014, RBI raised the upper age limit for bank managing directors and CEOs to 70 years from 65, in line with the Companies Act, 2013. Under the Act, a company can also appoint, or retain, people aged 70 years or older as director if shareholders approve it by passing a special resolution. As per RBI rules, the current managing directors at IndusInd Bank and HDFC Bank are set to retire in March and October 2020, when they would attain the age of 70. There have been changes at Axis Bank, ICICI Bank and Yes Bank, but those were not driven by the RBI’s age criteria, but due to performance and disclosure reasons. Yes Bank and Axis Bank appointed external candidates to lead the bank, while ICICI Bank is headed by an internal candidate. “In the interest of stakeholders, the RBI may take a dynamic approach and ask the current CEO to continue in an advisory role which can be constituted after the tenor ends … (he can) step down once the new CEO settles down in a few months,” said Rajesh Gupta, a lawyer at SNG Partners. In the US, the maximum retirement age for a CEO is 72 years, with companies having the right to prescribe a lower limit. In the US banking sector, JP Morgan and Morgan Stanley, the retirement age for CEO is 72. Nearly 75% of S&P 500 firms have by-laws that require CEOs to retire at or before 65 years of age. In March 2017, HDFC Bank elevated Paresh Sukthankar to the post of deputy MD but he resigned in August 2018, increasing the probability of an external candidate being appointed to lead the bank. 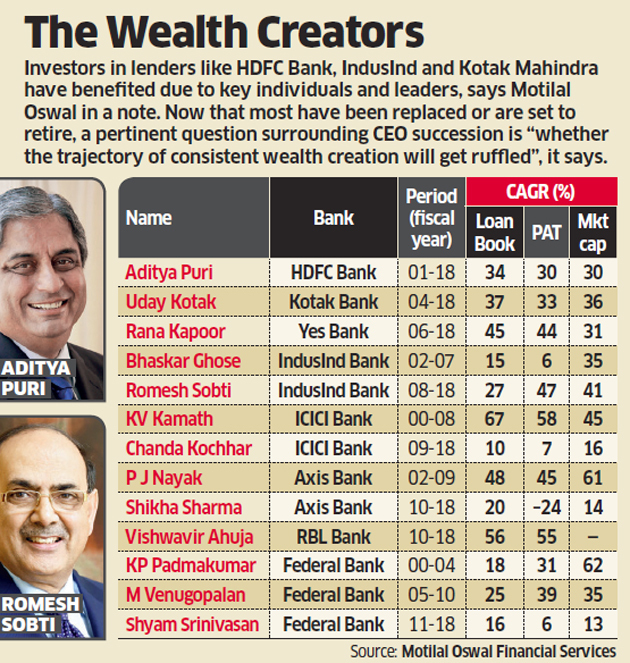 Over the past 25 years, HDFC Bank, under managing director Aditya Puri, has grown to become the largest private bank with a market share of 8.4% and market capitalisation of ?6.3 lakh crore. Its market cap is more than the next two private sectors banks combined as well as all PSU banks put together. This has been enabled by a steady 32% compounded annual growth rate in earnings over the past two decades. IndusInd Bank is a well-executed transformation story after Romesh Sobti took over the reins in fiscal 2008. After he took over, the bank has transformed from being a commercial vehicle financier to having a comprehensive product portfolio across retail and corporate segments. In his tenure, the bank’s earnings and market cap grew at a CAGR of 47% and 46% and return on assets and return on equity expanded to 1.8% and 16.5% in FY18 from 0.3%/6.9% in FY08, Motilal Oswal said in its report.